Recently, Tatiana Morand, a content and SEO manager, asked her employer for a raise. She got it. 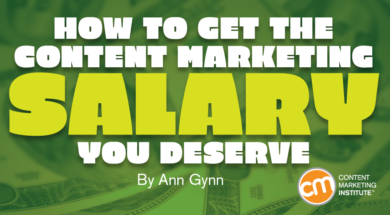 Content marketer Allison Gagliardi asked for 10% raises at two previous employers. Both times, she got the salary bump. How? Both of them say they didn’t just ask for a raise. They made a case for it. They spent the time evaluating the market, understanding their worth, and making a well-documented persuasive case to their supervisors. “Compensation rates are based on two factors – the value you are able to provide to your company, and the competitive landscape and salary in your field,” says Stacy Caprio, founder of Growth Marketing. Should your compensation be higher? If so, how should you get it? Let’s tackle both questions to see if and how you should address the salary conversation in 2019. Start your search by investigating what others in your industry, role, and region are making. What’s the average? How does your salary measure up? 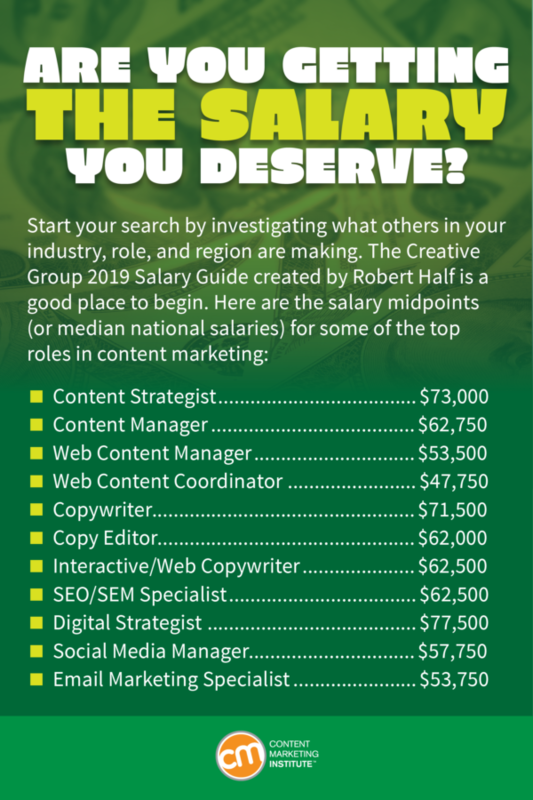 The Creative Group 2019 Salary Guide is a good place to start. It details how companies are finding it challenging to hire for content marketing roles in this competitive landscape. The gated content also covers 85 positions in the creative and marketing industry and details the highest, middle, and lowest compensation rates for each job. You can also use The Creative Group’s Salary Calculator to customize the figures for your city. Tatiana, who successfully asked for a raise at Wild Apricot, suggests pulling market data from your area. She looked at Glassdoor and LinkedIn when making her case. Simply doing your job likely isn’t enough to earn a compensation increase. Long before you ask for a salary bump, ask your supervisors about the business’s goals and the key performance indicators related to your role. Think about ROI. For example, “track the leads you receive from inbound marketing on Google Analytics, assign value to those leads (total revenue produced/total number of quality leads), and give them a clear picture of exactly how your content marketing is growing the business,” Ayodeji says. TIP: Don’t go for the fluff. Instead of saying, “I published 10 blog posts this month,” say how those blog posts influenced business results. As a content marketer, you already appreciate the value of knowing your audience and crafting a story that resonates with it. Do the same for your compensation story, says Graham Shorr, who got his start as a copywriter and is now director of growth at SquareFoot. “Some managers are highly analytical and solely focused on measurable results,” Graham says. In these cases, you should use data to explain your impact at each stage of your funnel. TIP: Don’t think of your request for higher compensation as a one-off campaign. Build a regular cadence of measuring and reporting success. Allison says she made her case to two employers, both internet marketing agencies, in the annual review process. With the first employer, she had been a content editor for three years and had received the annual 3% raises most everybody received. Then she made her case for and received a 10% increase. She took a similar tactic a few years later as a senior content manager at another agency. In her first-year performance review there, she asked for and received a 10% raise. How did she make the successful presentations? She wrote a letter outlining her compensation request and listed her accomplishments to date in a bullet format. She signed the letter – with an actual pen – and put it in a two-pocket folder. In the other pocket, she included emails/letters from clients and co-workers singing her praises. “It’s proof they just can’t argue with,” Allison says. Use numbers to impress. Include percentages, hours worked, money saved, people hired, etc. Be creative about your consolation prize suggestions. Allison offers some suggestions: a bonus if a certain benchmark is achieved, permission to bring your dog in the office on certain days, a standing desk, an air card (for Wi-Fi wherever you go), an improved title, a continuing education plan, or even control of the AC unit in your department (no, for real). Negotiate each term independently. If you bring out all your demands right from the start, you’ll overwhelm your employer. Instead, dole them out one demand at a time. Start with your biggest priorities. Emphasize that you value this job. Remind your employer that you enjoy working with them. Otherwise, they’ll think you only care about getting more money. Sprinkle these reminders throughout tough conversations to reassure your employer that, in spite of your demands, you’re still passionate about the company mission and team. When you’re negotiating, consider asking for a continuing education benefit like a trip to Content Marketing World Sept. 3-6. Use the code BLOG100 and save $100. Register today.